After Erin took me on a ski trip to Salt Lake City for Christmas 2010, I was far behind in the Christmas Karma. For 2011 I planned to take her to a resort in Wisconsin Dells, which is sort of like the Las Vegas of Wisconsin, except with water parks instead of casinos. 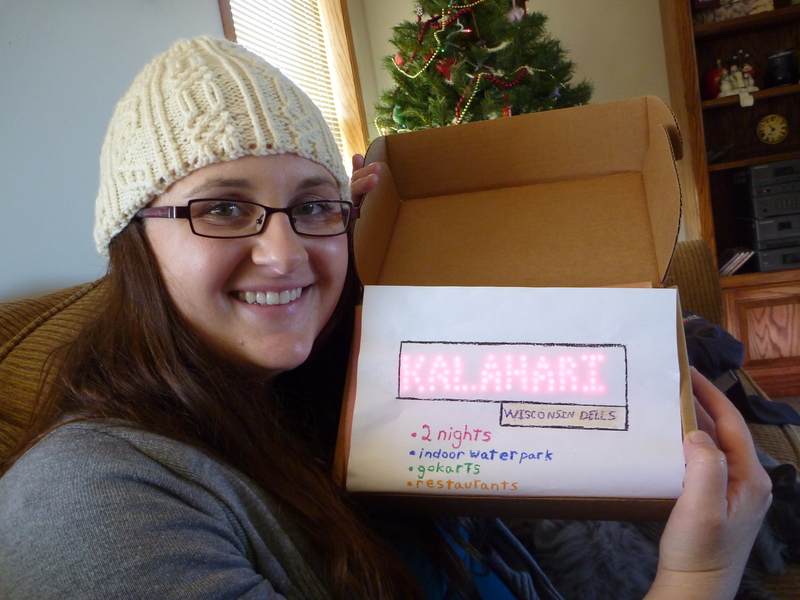 Of the many resorts, I decided on Kalahari based on recommendations of others and some research on the web. But just telling her wasn’t a great way to do the presentation. I wanted her to unwrap something. 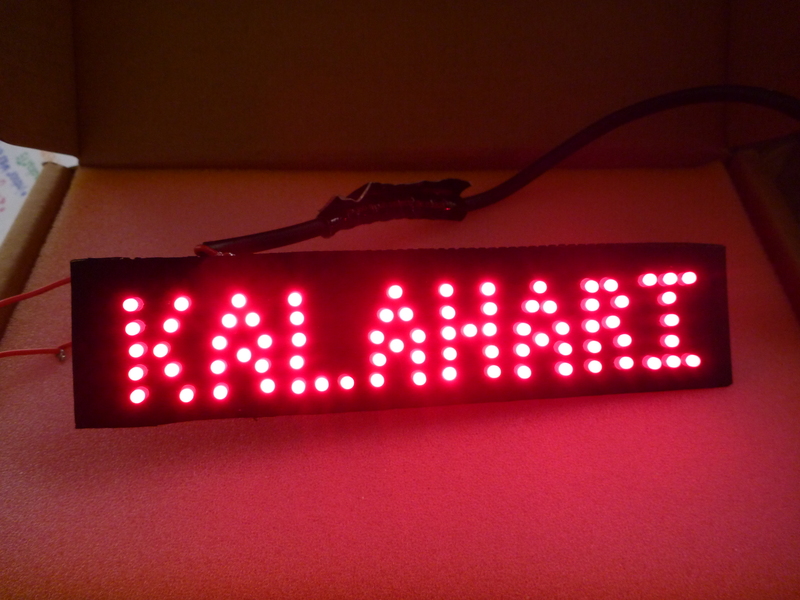 I’ve been working for a while on a portable electronic scoreboard, so I had all the materials to make a good LED sign with the name. The day before we were to leave for Kansas, I started the project. 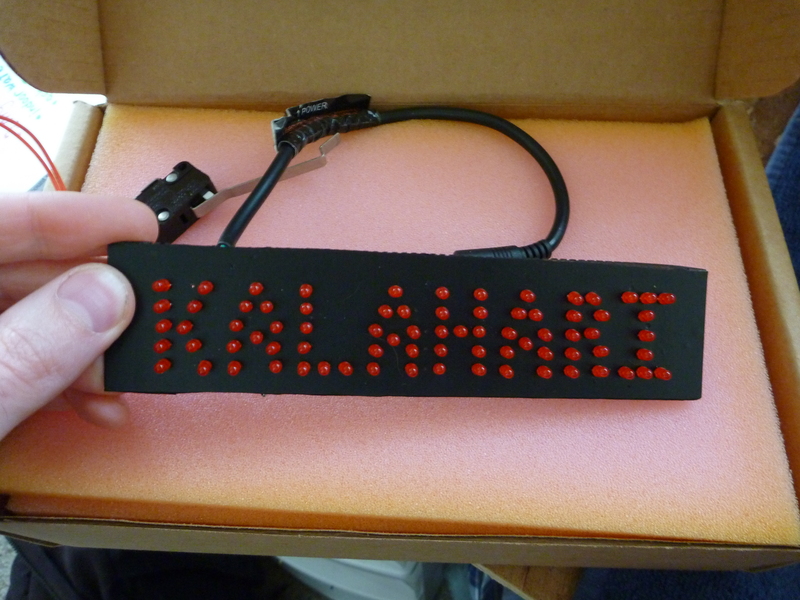 The idea was to make a big LED sign that said Kalahari on it. It would be battery powered, and a switch would turn it on when the box was opened so that it wasn’t on the entire time and running out of battery. That was as far as I got in planning before I started building. I borrowed a rechargeable battery from Sector67 to use as the power supply, then laid out the LEDs on a prototyping perf board covered with sticky black nylon paper. It took a couple tries to get it all to fit on the available board with legible letters and decent spacing. Then I found a switch that would work. The circuit was simple. The switch connected the + voltage to the board and the ground went directly to the board. The LEDs were connected with a resistor and two LEDs in series, and all those strings were in parallel. 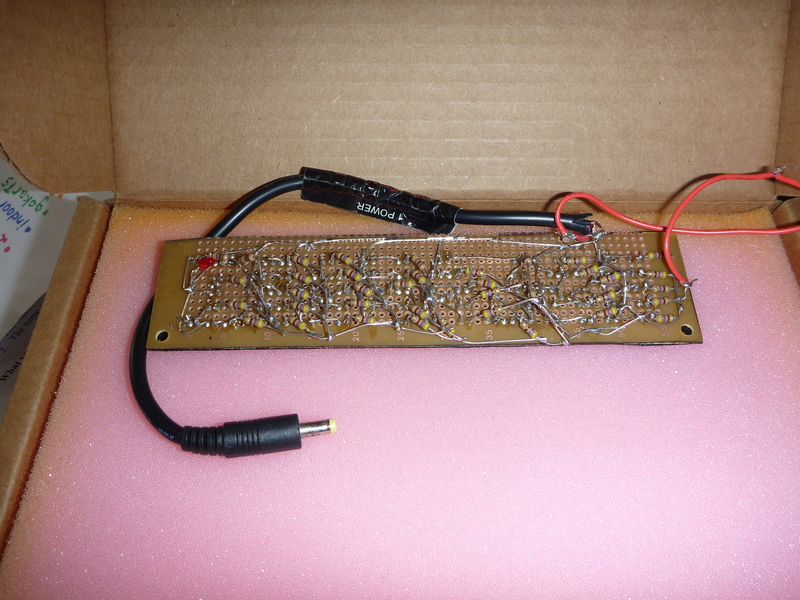 This meant a huge current drain, but I was limited to a power supply with only 6 volts, so I didn’t have much choice. 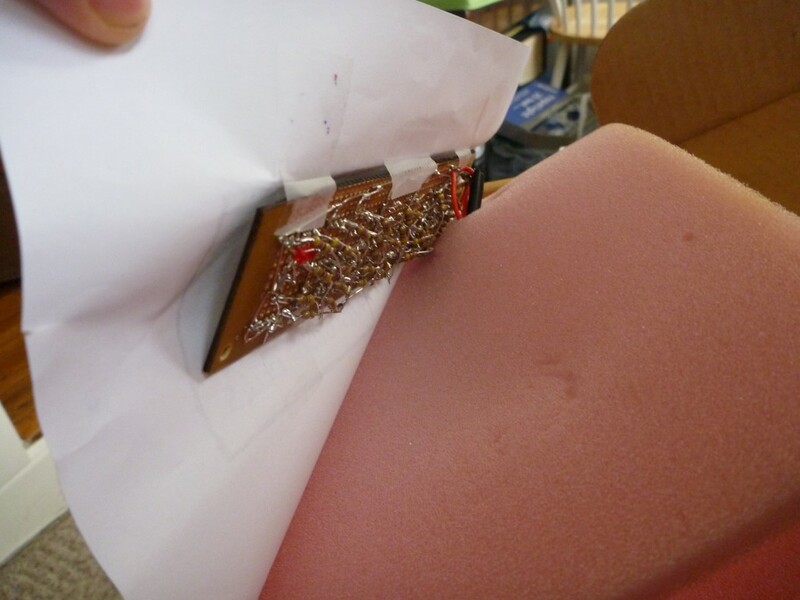 This also meant a LOT of soldering and a lot of current limiting resistors. There was an odd number of LEDs, so I put an extra one on the back side so that the circuits were all the same. With all these LEDs packed into a small space, it was very bright, so I struggled with a few different ways to do the presentation. I ended up taping the board behind a piece of paper so that the paper would diffuse the light a little. It ended up working great. The paper covered everything, including the switch. When the box was closed it was off, and when it was opened the switch was triggered, turning on the sign. The girlfriend was happy, so the project was a success. The next time I do something like this I’ll use less LEDs and instead of doing a sign of LEDs I think it would be better to have a piece that had letters cut out and was backlit by only a few LEDs. I also would have spent a lot more time on what was surrounding the sign. Using regular paper and crayon to draw was the best I could do with the limited time and resources I had, but it wasn’t enough for me. Construction took far longer than I expected, and I was a little disappointed with the results. I was working late into the night to solder it all together, and I barely had any time to work on the rest of the package. I can do better. Next Next post: I’m going to China!